cubaguama.com | Want to know before you go? Official Cuba Guama information and guide, get facts and latest news. Laguna del Tesoro at Guama is a lake which is 5km east of Boca de Guama, entering via the Canal de la Laguna. The lake and resort are accessible only by boat. On the far (east) side of the 92-sq-km body of water is the tourist resort named Villa Guama, built to resemble a Taino village scattered across about a dozen small islands. Boca de Guama is the main tourist center of the Peninsula de Zapata and a bit of a tourist trap to say the least. Visitors will find a restaurant, snack bar, ceramics shop, souvenirs shops and other amenities here. The main attraction at Boca de Guama is the Criadero de Cocodrilos, a crocodile farm, which is worth visiting. Visitors can hire a motorboat boat to take them across to the village, which is called Guama, or can hire a rowboat and go rowing on the lake which is a blast. A sculpture park next to the mock village has 32 life-size figures of Taíno indian villagers in a variety of idealized poses. The lake is called ‘Treasure Lake’ due to a legend about some treasure the Tainos supposedly threw into the water just prior to the Spanish conquest. The lake is stocked with largemouth bass, so fishers frequently convene on its shores. One of the biggest attractions at Guama is the Criadero de Crocodilos or Crocodile Farm, a huge complex displaying Crocodiles throughout their whole gestation cycle. Operated by Ecotur, the Criadero de Crocodilos is a Crocodile Farm breeding facility for the Rhombifier and the Acutus (known in Cuba as the caiman) species of crocodiles, large aquatic reptiles, and a sanctuary for sixteen species of endangered reptiles. As the largest crocodile farm in Cuba, the Criadero de Crocodilos has more than 100,000 residents, kept in a variety of pools. As part of Guama, the Crocodile Farm is incorporated into the resort right in the middle of the Laguna del Tesoro, part of the Natural Park of the Zapata Peninsula. In this breeding center you´ll find the crocodile separated into zones depending on their size. There is a guided tour which takes 45 minutes. 1st you get explanation about these majestic reptiles and then you are shown a skeleton. Then you go through the swamps to see the live ferocious animals in their natural habitat, from the babies to the largest adult crocodiles measuring up to 5 meters. They also do a demonstration of how the Taino Indians used to hunt them with a bow! And you can see how fast they eat their food when breeders throw them something to eat. The incredible thing about this tour is that you can touch them, and even take photos next to them. Children can hold a tiny alligator in the palm of their hand, it is a truly incredible experience for the younger ones. If you feel like trying the local delicacy, there is also a ranch where you can eat crocodile meat from the Crocodile Farm. Take control of your trip to Cuba and Rent A Car to visit Guama! Site of the Taino settlement and famous Guama lake hotel can be reached from Havana in less than 2 hours by car. 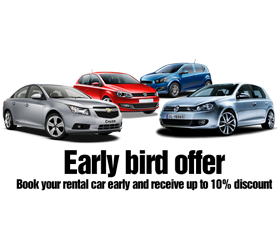 We have some incredible Guama Car rental offers from economic cars to the latest sport convertible models. We also offer 7 and 9 seat minivans in Guama Cuba, especially for larger groups or families. Booking your Cuba Car Hire in advance is crucial to your trip and, by checking our rates and availability you’ll be able to find the car to suit your budget and ensure it is ready and waiting on the exact day and time you choose. Book with your car in Guama with Havanautos, CubaCAR, REX or Via Rent a Car now to avoid setbacks or unnecessary unplanned costs while you’re in Cuba. Our exclusive Cuba-One-Way® program also caters for those of you who wish to collect your Cuban rent a car in say Guama and return it in another city, ensuring that your exact itinerary starting from Guama is organized in advance. Villa Guama in Cuba is located on the far side of Laguna del Tesoro or in English Treasure Lake, from Boca de Guama in Matanzas. Boats wait in Boca de Guama to take travelers across the lake, which is the only access to the resort. Villa Guama is uniquely designed to resemble an Indian Village and named after Guama a Taino, an Indian warrior who led a rebellion against the Spanish in the 16th Century. The Guama Hotel & Resort consists of a number of thatched roof huts, which look very rustic from the outside but are actually quite nice inside and come complete with air conditioning. The Village Guama complex is spread over a number of islands, and the whole area is very lush and green with palm trees and well maintained grounds. There are also simple sculptures of warriors spread out through the camp. Book your trip to Guama by contacting our chat agents! The Spaniards, who first arrived in the Bahamas, Cuba, and Hispaniola in 1492, and later in Puerto Rico, did not bring women in the first expeditions. They took Taino women for their common-law wives, resulting in mestizo children. Sexual violence in Haiti with the Taíno women by the Spanish was also common. Scholars suggest there was substantial mestizaje or racial and cultural mixing in Cuba, as well, and several Indian pueblos that survived into the 19th century. The Taino became extinct as a culture following settlement by Spanish colonists, primarily due to infectious diseases to which they had no immunity. The first recorded smallpox outbreak in Hispaniola occurred in December 1518 or January 1519. The 1518 smallpox epidemic killed 90% of the natives who had not already perished. Warfare and harsh enslavement by the colonists had also caused many deaths. By 1548, the native population had declined to fewer than 500. Cuba, the largest island on the Antilles, was originally divided into 29 chiefdoms. Most of the native Taino settlements later became the site of Spanish colonial cities retaining the original Taino names, for example; Havana, Batabano, Camaguey, Baracoa and Bayamo. The ancestors of Taino Indians entered the Caribbean from South America. At the time of contact, the Taino Indians were divided into three broad groups, known as the Western Taíno located fundamentally in Jamaica, most of Cuba, and the Bahamas, the archetypal Taino was from Hispaniola and Puerto Rico and the Eastern Taino from the northern Lesser Antilles islands. It is said that, based upon numerous artifacts found that the Taino Indians tribal groups were in constant conflict with the Caribs of the southern Lesser Antilles.